“Fear of science and technology, which have empowered humans since the beginning of history, is the height of folly”: so writes Teller, inventor of the H-bomb and reputed model for Stanley Kubrick’s Dr. Strangelove. Now 93, Teller appears ready to forgive old foes like J. Robert Oppenheimer, who turns up at many points in this oddly engaging memoir. Not that he was wrong, he hastens to add, in not defending “Oppie” when the latter was dismissed from his nuclear-weapons research position as a security threat, having flirted with communism and having made, in Teller’s presence, odd references to governmental tyranny. He even forgives atom spy Klaus Fuchs for his treason, for, writes Teller, “from what I have seen of the competence of Soviet scientists, I have reason to believe that they could have produced the weapons independently, once they knew that an atomic bomb could be produced.” Teller’s overarching theme here is the politics of science, the application of political power to questions of technology, and he writes as an evident master of the game, basically untroubled by the moral implications of the weapons he developed—but convinced nevertheless that Harry Truman would have done better to explode an A-bomb over Tokyo Bay during the evening rush hour so that the Japanese could have witnessed its power and surrendered without loss of life. Though it will be disturbing to many readers, Teller’s narrative has many fine moments: he writes affectingly of his youth in a Hungary, and later Germany, in which anti-Semitism was on the rise, pays quiet homage to his beloved late wife, and even explains how he lost a foot in an accident involving a trolley car. (Terry Southern and Kubrick cruelly commemorated that loss by placing their Dr. Strangelove in a wheelchair.) 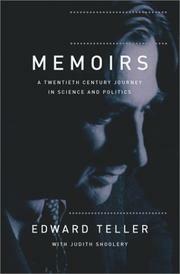 But those fine moments are diminished somewhat by Teller’s snappish dismissals of those who question the ethics of modern science, and he closes by insisting that we moderns have nothing to fear from today’s bugbears such as genetically modified food, cloning, and nuclear power, all of which, he assures us, will lead to a brighter tomorrow. This memoir will not silence Teller’s many critics; indeed, it will provide them further ammunition. Still, a useful, if (of course) self-serving, contribution to the history of science and the literature of the Cold War.